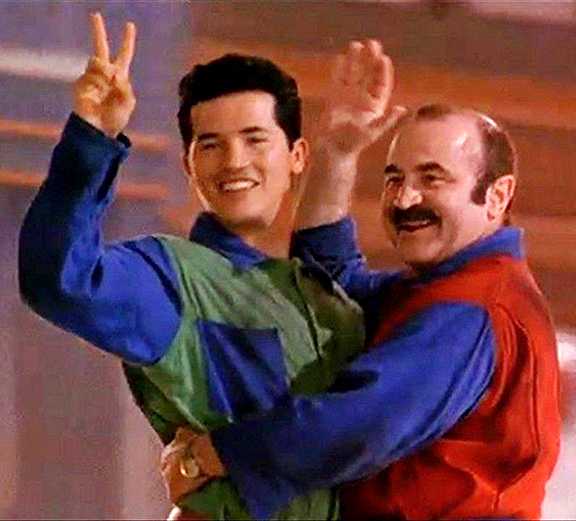 John Leguizamo and Bob Hoskins as Luigi and Mario. Accord­ing to the author­i­ta­tive guide to all things Mario – MushroomKingdom.net – the script called for the Mario Bros. to have a last name. The char­ac­ters were never given names in the game series and the pro­duc­ers decided that because they were the Mario Bros., their last name must be Mario. Accord­ing to the site, cre­ator Shigeru Miyamoto was quoted in Game Informer as hav­ing “laughed rather loudly” when he heard this info. Princess Daisy, first intro­duced in the Game Boy’s Mario Land, does not rule the Mush­room King­dom; she’s the leader of Sarasa­land. Luigi isn’t even present in the game, though he later devel­ops a rela­tion­ship with her as Mario and Peach’s counterparts. 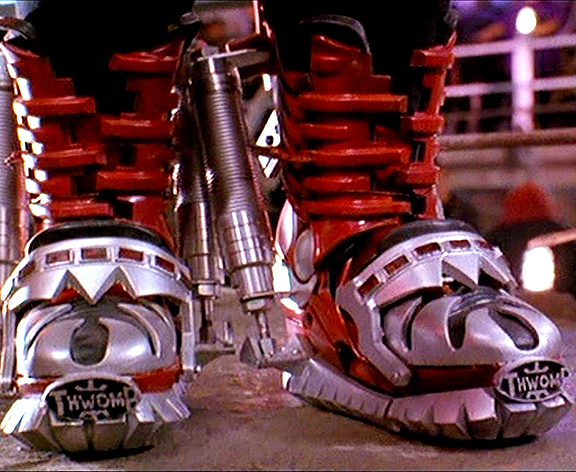 Thwomp Stom­pers as worn by Big Bertha. 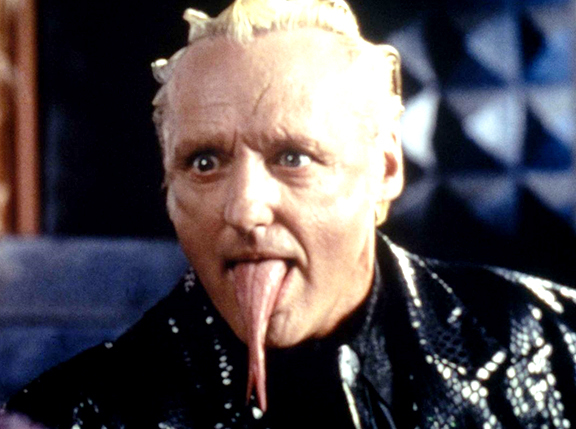 The weird jump boots in the movie really had noth­ing to do with Mario games. Also, Big Bertha is a fish in the game, not an actual woman. We’re not sure why the goom­bas were made to be tall reptilian-like crea­tures when they’re lit­er­ally liv­ing mush­rooms gone bad. 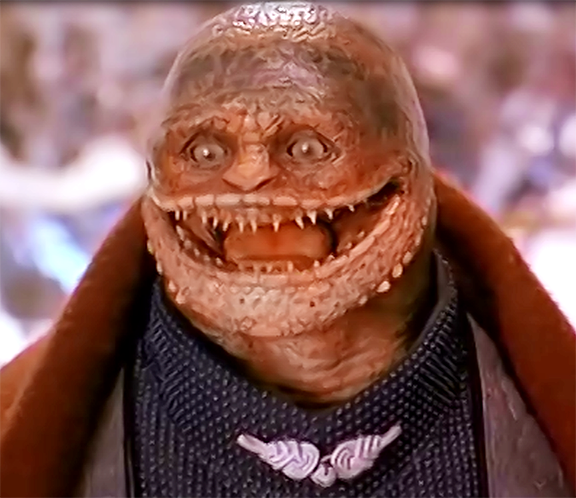 Den­nis Hop­per as King Bowser Koopa. While Den­nis Hop­per made a believ­able Bowser, King of the Koopas, sadly, he isn’t a lizard. Bowser has been con­firmed to be an evil tur­tle with a spiked shell. This entry was posted in Top 5 list and tagged 1Q2016, Daisy, film, Luigi, Mario, Mario Mania, Mushroom Kingdom, staff, Super Mario Bros., Top 5. Bookmark the permalink.